October 11, 2018 was a very special day for the American people. After more than a decade of waiting, a sea of local, state and federal law enforcement professionals along with friends, family members, and the loved ones of fallen officers gathered together under a gray sky from around the country at Judiciary Square in Washington, DC for the ribbon cutting ceremony, opening of the new National Law Enforcement Officers Museum (NLEOM), the first public museum devoted to law enforcement. Constructing a museum in Washington, DC is no easy task, and the NLEOM was no different. The red tape began in 2000, when Congress approved the project with the proviso that no work could be started until all of the funds were available to cover construction costs. What followed was a decade and a half of applications, design changes, and delays before all of the necessary authorizations from an assortment of committees and fine arts commissions finally sealed the deal. A Capitol Campaign under the chairmanship of former attorney general John Ashcroft started in 2007. Nine years later, ground was finally broken when the one hundred million construction dollar goal was reached through the combined generosity of both corporate partners and thousands of private contributors. The complicated architectural and building rules in the nation’s capital that slowed the process also stirred the creative impulses in the museum’s founders. On the somber side, there is a room of remembrance, honoring American law enforcement officers who have died in the line of duty since the founding of this country. It also contains an electronic list containing all 21,541 names of fallen officers that visitors can scroll through and inscribe a thoughtful note of appreciation for a particular officer’s sacrifice. The museum has something for all ages, but especially for young men and women who may be thinking of a career in law enforcement. Among the interactive features is a state–of-the-art display that allows a visitor to “walk in the shoes” as Craig Floyd, the Executive Director of the National Law Enforcement Memorial Foundation (NLEOMF) noted, of a dispatcher in a 911 operations center. Another offers a life-like experience as a forensic investigator facing the real time complexities of a major investigation. Other highlights include a law enforcement timeline from the Colonial period to the present along with “Reel to Real,” a depiction of Hollywood’s cinematic versions of policing and real life. The centerpiece of the collection is a mock-up of legendary FBI director J. Edgar Hoover’s Department of Justice office complete with his desk, chair, flags and desk accouterments, which were gifted to NLEOM by the J. Edgar Hoover Foundation some years ago. The items on display represent less than one percent of the museum’s holdings. The entire museum collection will be available for researchers from around the world to study for decades to come. To everyone’s surprise, Clint Eastwood opened the morning’s program. The legendary actor, producer and director, serving as Honorary Chairman of the Museum’s Capitol Campaign, offered his appreciation for the contributions and sacrifices that America’s law enforcement professionals have made since our country’s founding. Greg Brown, chairman and chief executive officer of Motorola Solutions Corporation described the relationship between his company and law enforcement that began nearly a century ago when Motorola first introduced communications systems into police vehicles in the mid-1920s. Then, with justifiable pride, he thanked the NLEOM’s leadership for recognizing the company’s continuing financial and moral support by naming the structure the Motorola Solutions Foundations Building. As a former governor of Missouri, U.S. Senator and Attorney General of the United States, John Ashcroft, in his role as Chairman of the NLEOM Board of Directors, stressed the themes of respect, honor and remembrance by reflecting on the critical role that law enforcement plays in guaranteeing the everyday freedoms that many Americans take for granted. Deputy Attorney General Rod Rosenstein echoed Ashcroft’s remarks by pointing to the museum’s goal of strengthening the “relationship between law enforcement and the communities it serves.” In America, he told the audience, the “police are the public and the public are the police.” To emphasize this citizen–police bond, he reminded us all that it was Ben Nighthorse Campbell, Colorado citizen, businessman, rancher and U.S. Senator who shepherded the passage of the museum’s authorizing legislation through the Senate. Charles Ramsey, Honorary Member of the museum’s Leadership Council concluded the ceremony with a remarkable speech. 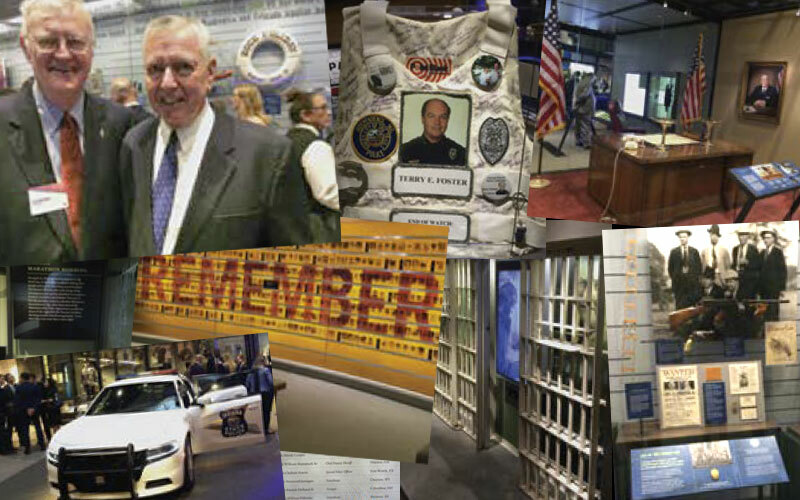 The former chief of the Philadelphia Police Department and Washington Metropolitan Police Department and Chicago’s Deputy Chief, and now retired, wove his commitment to the museum’s mission with a brief recounting of his own forty-eight-year law enforcement career. After so many years of protecting Americans, he told us all, his only regret in life was that he could not do it all – over again. Closing the morning on the perfect note, the chief, pointing to the museum in the background, described it as both a symbol of all that is good about America and an education center where generations to come can learn about this noble profession. Law enforcement in America, he reminded us, is not simply a thin blue line separating evil from good; it is, rather, the thread that binds together the fabric of our democracy. For those of you who may be planning a visit to Washington, I urge you to consider a stop at the Museum. It is situated in the heart of the city, at 444 E Street Northwest, walking distance from the Mall, and easy to reach by Metro Transit (Judiciary Square Metro Stop). Additional information and admission charges are located on the museum’s website, lawenforcementmuseum.org.